I don’t know if anyone was at all interested in last week’s post on rabbits in the Super Mario series, and Easter is over now, but I’m going to do a follow-up about rabbits in other games anyway. I’ve already covered a few of them anyway. Here’s something I wrote on the legless Rabites from the Mana games, and this one addresses the Atari game Springer. When I asked about favorite video games rabbits on Facebook, I received a few interesting suggestions. One was the vorpal bunny from Ultima Online, which turns out to have quite a history. As far as video games go, they first appeared in the Wizardry games from the early eighties, some of the earliest dungeon-crawling role-playing video games, and highly influential on the genre in general. For instance, the Slimes from the Dragon Quest series were inspired by Wizardry’s Creeping Cruds, although Akira Toriyama’s designs made them much cuter than their predecessors. 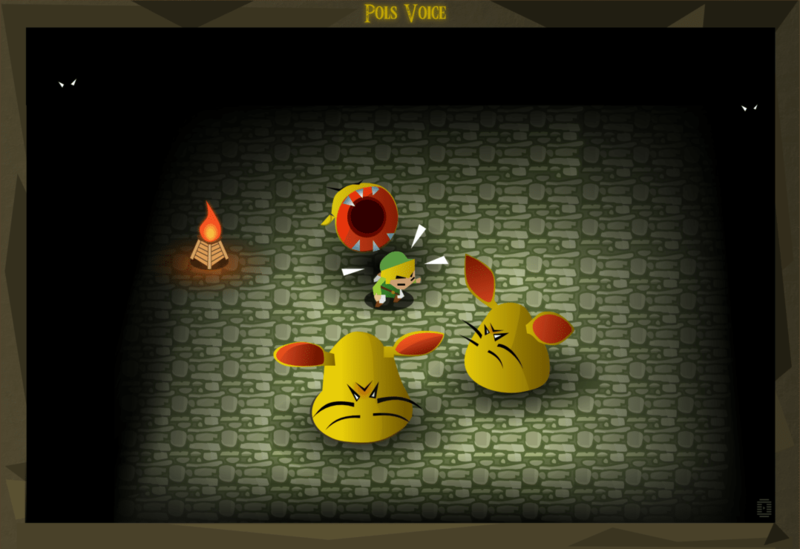 The Vorpal Bunnies are initially harmless-looking animals, but they have sharp teeth and are prone to beheading adventures, which will kill a character instantly. The beheading is tied to the name “vorpal,” the kind of sword used to slay the Jabberwock in Lewis Carroll’s poem. 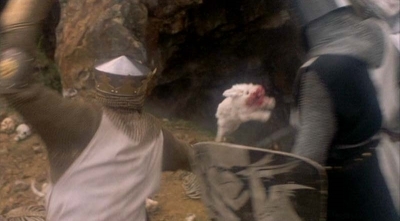 It’s almost certainly also a reference to the Dread Killer Rabbit of Caerbannog from Monty Python and the Holy Grail, and indeed I believe the name was used in a tabletop RPG adaptation of the movie before making its way into the video world. As indicated here, however, the Pythons were hardly the first to show surprisingly dangerous rabbits. The image appears quite a bit in medieval manuscripts, intended as humorous due to its role reversal. You know, like a cowardly lion. The Rabbit of Caerbannog is said to have been specifically inspired by an image of a knight running from a rabbit at Notre Dame. In Ultima Online, at least from what I’ve been able to find, vorpal bunnies will frequently run from battle by escaping down rabbit holes, and will sometimes leave behind brightly colored eggs as loot. The Final Fantasy XII version seems to have been based on this, as it also frequently runs away. Its tail contains an oil that can be used in potions. 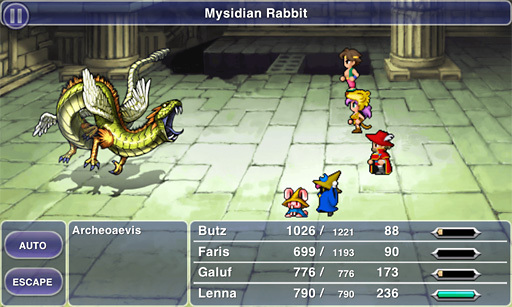 There are a few other significant rabbits in the FF series as well. 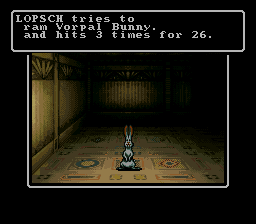 This is basically a losing spin that results in this bunny showing up and not doing much of anything, although as a consolation prize he’ll heal your party a little bit. He’s dressed in traditional black mage garb, and will show up with the dialogue “Mugu mugu?” That’s Japanese for “munch munch,” so he’s probably eating something, perhaps a carrot in Bugs Bunny style. 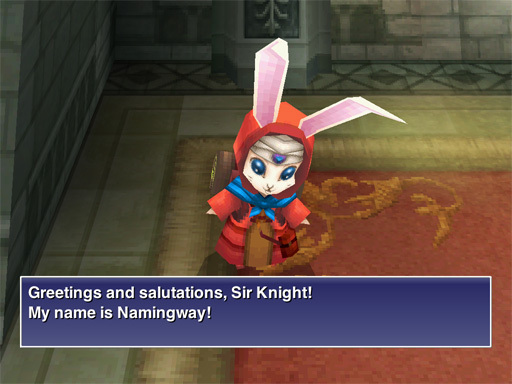 He’d also appeared in FFV, where he was one possible result of a ranger trying to summon an animal, and there he did nothing at all. I don’t think he appears again until FFXIV, in which he’s once again the result of a failure. Mysidia, for those who might not know or have forgotten, is the name of the town of mages in both FFII and FFIV. I can’t think of any particularly famous rabbits from the Dragon Quest series, but DQIII does introduce the Horned Rabbit, one of the weakest monsters in the game despite that threatening-looking horn. I guess it’s still pretty small. In the more recent translations, which use a lot of puns, they’re instead called Bunicorns. The stronger version is the Spiked Hare, which was a pun even back in the old translations. 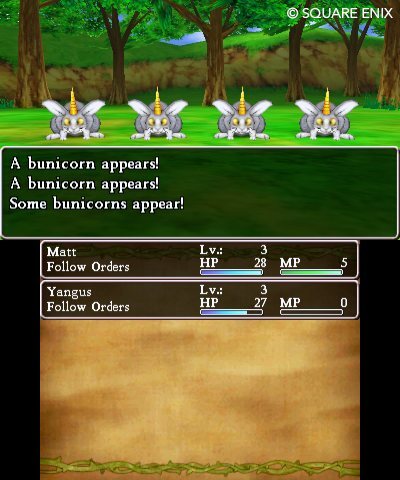 I understand that DQX brings in some other varieties, a golden one and a Bunicorn Queen. And no, I’m not counting the bunny girls from casinos. There’s also a bunny mask in Ocarina of Time and Majora’s Mask, which can increase speed and jumping distance. Apparently rabbits in Hyrule are endangered due to hunting at the time of Ocarina, but if you gather a few together it shouldn’t take them too long to repopulate. The first Legend of Zelda has the Pols Voice, which I don’t think has ever officially been defined as a rabbit, but it certainly resembles one. Well, they have big ears and whiskers and jump around, anyway. The manual for the first game just says they’re ghosts with big ears, but perhaps they’re the ghosts of all those rabbits killed by hunters. The ears are a tip to how you’re supposed to defeat them, with noise. The only problem is that the only item in that game that makes noise is the recorder, and it has no effect on them. This was actually a mistake in translation, as the Japanese controller had a microphone of sorts that you could make noise into, instantly killing all Pols Voices on the screen. The American controllers don’t have this, but for some reason nobody caught the fact that it still says you can defeat them with loud noises in the instruction booklet. Didn’t anyone fact-check these things? Instead, they’re vulnerable to arrows, which didn’t work on them at all in the Japanese version. Really, the microphone thing is really bizarre anyway, because there’s no indication that this sound exists in-game. Are we supposed to imagine it’s Link making the sound? Or is it some ghostly voice helping him out? In other games in which Pols Voices appear, they can be defeated with musical instruments, which probably should have been the case all along. And in Phantom Hourglass, it’s revealed that they have giant mouths on their undersides. By the way, is the name “Pols Voice” supposed to be possessive, like they have something to do with the voice of someone named Pol? Do they give sermons like St. Paul the Apostle? If you pronounce the first word with a long O, it rhymes with “Rolls Royce,” although I assume the O is supposed to be short. This page has some speculation about the name, although I’m not totally sure it was supposed to mean anything. Other lagomorphs that came up in the discussion included the bunnies you rescue from Dr. Robotnik’s machines in the Sonic games, Max from Sam and Max, Coco from Animal Crossing, and Usagi Yojimbo. I’m really not that familiar with Sam and Max, although it sounds like something I might like. 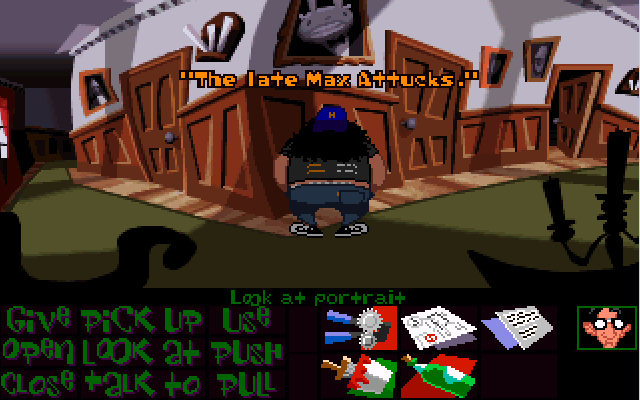 Max actually appeared in a painting in Day of the Tentacle. There are several rabbit neighbors in the AC games, but Coco is the weirdest, as she has hollow eyes like a Gyroid. Since the Gyroids are based on funerary sculptures, does that suggest Coco is dead? That’s what the Animal Crossing Wiki suggests, with her current body possibly being a vessel for her disembodied spirit. Her Japanese name is Yayoi, the period in Japanese history when haniwa were made. Her English name might be a references to coconuts, since her head looks like one. It’s dark, sure, but don’t forget that this is the same series with a cat who keeps losing her face and a dog who appears to be permanently injured. 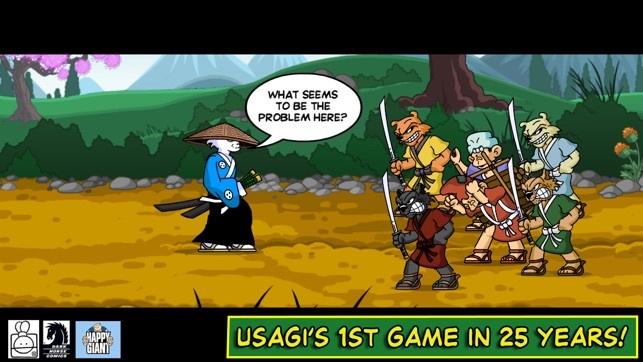 As for Usagi, I’m currently reading some of his old comics, but I didn’t realize he was in any video games. When I looked it up, I found out he had two, and they were released twenty-six years apart. The first was a side-scroller for the Commodore in 1987. Based on its description, the strangest thing about it is that it incorporates a karma score, and if yours gets too low, Usagi will commit seppuku. Appropriate for a samurai, perhaps, but pretty dark. The 2013 game, Way of the Ronin, is also a side-scroller, but I don’t know whether it incorporates suicide. This entry was posted in Animal Crossing, Animals, Authors, Comics, Dragon Quest, Final Fantasy, Lewis Carroll, Magic, Mana/Seiken Densetsu, Monsters, Monty Python, Mythology, Sonic the Hedgehog, Ultima, Video Games, Zelda and tagged a link to the past, black mage, bunicorns, coco, dragon quest iii, dread killer rabbit of caerbannog, final fantasy ii, final fantasy iv, final fantasy v, final fantasy vi, final fantasy xii, final fantasy xiv, ghosts, gyroids, haniwa, horned rabbits, humingway, jabberwocky, lagomorph, link, majora's mask, monty python and the holy grail, moon, mugu mugu, mysidia, mysidian rabbit, namingway, ocarina of time, phantom hourglass, pols voice, rabbits, rabites, samurai warrior the battles of usagi yojimbo, seppuku, setzer gabbiani, spiked hares, springer, the legend of zelda, ultima online, usagi yojimbo, vorpal bunnies, way of the ronin, wizardry. Bookmark the permalink.